Working as The Frugal Traveler for The New York Times, Matt Gross circled the globe in search of authentic budget experiences. As he acknowledges, this would seem to be the cushiest gig of all time. Most cubicle dwellers might eagerly lust after this seemingly ideal lifestyle and think that Gross is one lucky s-o-b. Free of the nine-to-five and family obligations, it seems that his life should be nothing but “happy trails.” Yet Gross is “warts and all” in his attempts to shed light on the effects (or lack thereof) of travel on one’s psyche. Nonstop distant adventures do not mean a vacation from niggling self-recrimination or even boredom. The author trudges along the twisted inner byways of his mind, letting us see how travel may not always provide the respite that we seek. 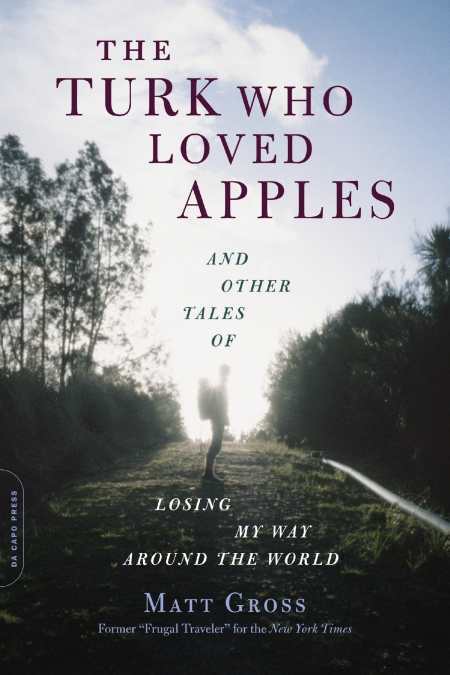 At its core, this book is as much about an ongoing and messy series of emotional expeditions as it is a behind-the-scenes glance at the world of travel writing. What’s more, globe-trotting can pose difficult questions about our status as wealthy denizens of the developed world. Can our interactions with a third-world populace ever be on an equal footing? What are our responsibilities as travelers? Perhaps even more pertinent: Why do we travel and what can we find far away that we cannot at home? In short, what’s the point of travel? An ongoing search for the ultimate in authenticity? Even more “seen that” anecdotes with which to enhance our dinner-party repartee? However, the author eventually tires of churning out penny-saving travel tips. Low-cost adventures for their own sake aren’t for him. He travels for the experience. Snagging bargains is not his end-goal but merely a means to travel farther and more often. In addition, it’s the people whom Gross meets and his authentic connection with these characters that gives this volume its real bite. Sure, his descriptions of icky digestive problems and nibbling horsemeat sashimi give him a certain street cred, but Gross isn’t a masochist striving to accumulate gonzo points. From his raw accounts of bittersweet and mutually exploitative liaisons with prostitutes, to his tale of accepting proud and gracious hospitality at a refugee camp, this is primarily a collection of stories about people. There are funny folks, one-of-a-kinds, and sometimes unhinged or even dangerous ones. On the plus side, there’s the eponymous apple-loving Turk who cast aside a corporate career to seek bliss in an orchard, and there’s the lackadaisical man-about-town who would go on to lead Tunisia’s Republican party. Less charming is the sulky Brit who likens spotting a wild tiger to watching paint dry. If you’re the kind of person who enjoys random conversations in dive bars, casually delving into your taxi-driver’s tangled home life, or swapping philosophy at a bus stop, then this book is for you. If you drool at lush anecdotes of cinnamon-scented bazaars, crimson tropical sunsets, and rewiring a quaint farmhouse in Provence, then these tales may not be quite your thing. I’m a fan of Gross’s honesty and his preference for engaging reality over whitewashed escapism. His combination of neurosis, Yankee pragmatism, and a genial willingness to paint himself in a bad light ultimately make him more amiable to this reviewer. Unlike Eat, Pray, Love, there is no tidy progression from suburban disillusionment to Sunday-supplement enlightenment. Nothing happens in thirty days or even a year. Those seeking Hollywood-style resolution before the final credits may want to look in the next aisle for travelogue bliss-in-a-can. But I did feel that I got to grapple with what being a travel writer might really be like—and it surely was an absorbing journey.